Is There A Healthy Frozen Dinner Out There? After 79 years ... I am beginning to see the light. I do believe it when I read that processed food should be avoided. I do it to a large extent. HOWEVER...recently my partner and I have gotten lazy and often have not "done any marketing" which means we have no food to prepare for supper. Rather than head for a restaurant, I will head for the frozen dinner section of the nearest food store and pick up frozen dinners. I have been buying "Amy" and "Kashi" brands which sound like reasonably good. My question is: Am I fooling myself? Are these as processed as all the other brands? Thanks, Myrna! I am so glad that you are still working on eating healthier. All the ingredients were recognizable and I would say that it tasted pretty good. If you ate 1/2 of it (170 calories) this would be a great hot snack. Kashi has managed to put together a vegan meal with real ingredients without a ton of sodium or sugar. It packs 20% of your daily value of Iron and Vitamin C. The ingredient list includes: plantains, black beans, sweet potato, and KALE! 1. Not all Kashi meals are the same. I found one with 680 mg of sodium (yikes) so stick with Mayan Bake or another that has less than 400 mg of sodium per serivng. 2. The packaging is not exactly GREEN. You are looking at a cardboard box and a plastic tray to toss out after dinner. 3. The price ($4.30) is exorbitant for most. Since I have 4 people in my family, I am looking at $17 for a dinner that I could have made for (I am guessing) about $10. When you are stretched for time and don't want to clean the kitchen (etc.) - give them a try! Anyone else find something in the frozen section that they like? Please share. I enjoy the Mushroom Trio & Spinach Kashi thin crust pizza. The nutrition facts online state about 250 calories per serving, which is a generous 1/3 of the pizza. I do see that sodium is a bit high though. I usually find these on sale for around 5.00, so I'll always keep a couple. A frozen pizza with a bit much sodium is a much better 'nothing to cook' fallback than fast food or other junky foods could be. Thanks for your feed-back. I'm glad to have your opinion ... that you liked it, too. Frozen meals may not be the best choice for families economically, but for a single person like myself it can be cheaper and quicker than cooking an entire meal and certainly cheaper than eating out. I enjoy eating Amy's frozen entrees. Any chance of a post on this brand? @Emery - I have an Amy's Burrito to test in my freezer so yes! is there anything specific you would like me to review? I am usually afraid of frozen, for the reason you stated but I do enjoy Amy's no cheese pizza. I add sliced chicken or a lean protein and sometimes some veggies I have left over in the fridge to make it more complete! I often double my cooking when I can. When I make eggplant parm or lasagna, I make two pans, eat one and freeze one. This works well with soup and chili too. When I make brown rice, I make a double batch and freeze half. If I need rice I don't have to wait the 45 mins. it takes to cook it and it can be used in a quick stir fry. You can have your own "frozen dinners" that are healthy. I LOVE this meal from kashi. It's easily the best one. My husband does love a frozen pizza on Sunday while he watches football. We finally came to a compromise and found one that he likes to eat and is all-natural: Newman's Own pepperoni. The stats aren't too bad if you stick to the recommended portion size. I do like Amy's frozen macaroni and cheese, but I've only bought it once because it's too expensive. So really the only frozen meal we buy is the pizza. 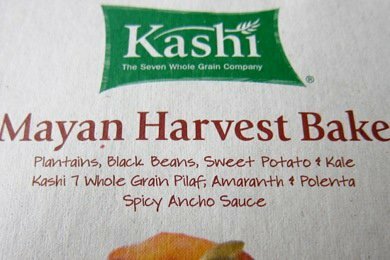 Lisa, Kashi Mayan Harvest Bake is my favorite frozen meal out there! So delicious. We also like some of the Indian meals that Trader Joe's sells in lunch size portions. Organic Bistro makes great frozen dinners that are low in calories and sodium as well. Their Savory Turkey has 370 calories, 10g fat, 240mg sodium, 7g fiber, 31g of protein. Thanks for the post! The Kashi Black Bean Mango frozen entree is also very good and sodium is under 400 mg. The Kashi Black Bean Mango... Yipee! Our Publix had a special on this ... 4 boxes for $10.00. I wish my freezer could hold more than 4. When you look at the Amy's brand - beware. A lot of them are very high in fat. There are some good Amy's options, but I'd say not the majority. See the veggie pot pie, for example. The brown rice and veggie bowl is on the good end of the spectrum. Try the Amy's Frozen Indian options. They are very good, low in calories, high in protein & fiber and most importantly not completely overloaded with salt. They are the only frozen meals I will buy. They show up at all of my local grocery stores and Target.